Have you ever imagined the discouragement and fears specific to families dealing with homelessness? If you talk to anyone who is experiencing homelessness, it’s not hard believe that 100% of them will tell you that they never expected to be homeless. It certainly isn’t a choice made voluntarily. Contrary to popular stereotypes, a substantial majority of families who live without a permanent home have not relocated to a new city, have no family members addicted to any substances or are mentally ill, are not criminals, do not want to be “taken care of,” are not lazy, and do not want to continue their current homeless condition. They will do everything they can to return to the life they once had – with a job, a home, and a family doing all the family things that most of us take for granted in America. We’ve often heard the phrase, “Many families are just one paycheck away from being homeless.” As devastating as that reality is, what you don’t hear so much about is even more devastating: once you become homeless, you are not simply “one paycheck away” from being back in a permanent home. It can take years to regain everything that’s lost the moment you hit that street with no home to return to. And for families, those losses often include the crippling loss of the family unit itself, which can never be completely repaired. Over time, no matter how hard they work, and play by the rules, the downward spiral can dig the families into a hole so deep they believe they can never climb out. When some of the members of a community are living in their cars or on the streets, the entire community suffers. Just as there is no single cause of homelessness, there is no single, one-size-fits-all solution to the circumstances that cause and perpetuate homelessness. It takes an approach of multiple solutions to tackle and overcome the complex condition we call “homelessness,” as we’ve seen in the past several weeks as we’ve looked at some of the successes in this ongoing battle in Santa Cruz County. Another solution that’s been working in the Pajaro Valley since 1983 is the process by which Pajaro Valley Shelter Services meets this challenge. Founded in 1983 as an emergency shelter for domestic violence victims (primarily women and children), over the years PVSS has developed into a process that has provided permanent housing solutions for more than 6,500 individuals, mostly as family groups. This doesn’t just mean getting people off the streets and into safe housing, it means providing them with the tools and skills necessary in order to maintain a safely-homed situation going forward. While it’s still a service primarily for women and children – the most vulnerable of those experiencing homelessness – it also offers the same resources to families with fathers in the home. PVSS understands that for individuals and families, there is more to a permanent solution than just getting people into physical shelters, apartments, or houses. Without an understanding of the underlying causes that brought an individual or family onto the street, and without the tools to keep it from happening again once the cycle begins, it becomes a revolving door between the shelters and the streets. So their programs are more than just a hand-out. They each involve a committed partnership between the PVSS case worker, the client/family, and the many other available services and resources designed to facilitate the move from homelessness to a lifetime of being housed and safe. This include partnerships with other non-profit organizations as well as local businesses and landlords. Care of Housing (e.g. cleaning and basic maintenance skills to become good tenants). PVSS clients are given food and shelter first. With the security of knowing they can depend on these basics for a fixed period of time, the parents and family members over the age of 18 can turn their attention to developing the practical skills necessary to accomplish the transition from homeless, to temporary, to permanent. Housing is provided through properties fully owned by PVSS serving four different levels of need. Emergency Shelter for Homeless Women and Children is just that – immediate emergency housing for single mothers with children for up to 90 days. The Transitional Housing Program consists of 13 units and allows families up to 24 months to stabilize and receive help over time. As with all PVSS housing programs, the Transitional Housing Program families sign a contract to abide by strict program requirements. Each family member over the age of 18 develops a written individual life plan with a PVSS Case Manager. Residents are required to set goals and save money. PVSS offers training in areas such as budgeting, job and parenting skills, and methods to find and keep stable housing. The Annex provides housing and services to single fathers with children, families with males over the age of 12, or 2-parent households with children in one of two Annex units for a maximum of one year. And finally, since 2009 they’ve been able to offer a Long-Term Housing Program in four units, and they acquired two more units on May 24th of this year. upping the number to six. Families who are making progress toward stability but need more time to build resources and skills are provided housing and support services as needed until they become fully independent. Families pay a portion of the full market rental value, with the balance supplemented through Section 8 funding. The successes of Pajaro Valley Shelter Services have a measurable impact on the entire community. 7,000 people people served over the past three decades or 34 years – approximately 250 people every year. 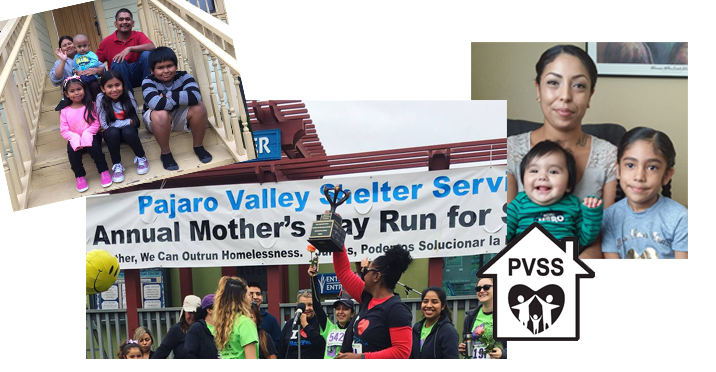 The PVSS 34th Annual Mothers Day Walk/Run this year raised $71,000, which will be used to continue providing support to Santa Cruz County’s most vulnerable community residents. But the real impact isn’t measured in numbers. It’s the smile on the faces of a family as they watch their dad’s transformation from hopelessness to confident hope through training and self-confidence as he returns to the work force. It’s the exuberant joy of a family receiving the keys to their first home in years. It’s the feeling in our own hearts when we’re a part of communities coming together in support of the most vulnerable, reminding ourselves that we are all “us,” vital members of one community. These individual successes, like a heartbeat, spread a warm, connecting pulse throughout the entire community, making us realize that the “whole” of the end result is greater than the sum of its parts.